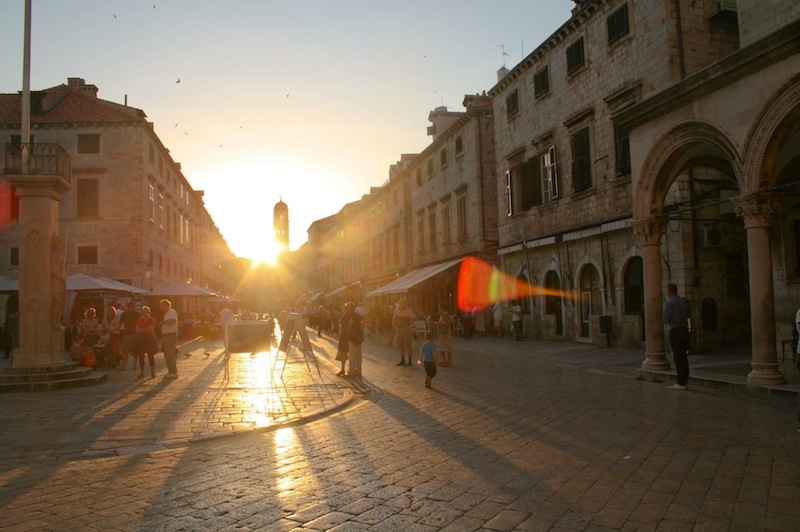 Here are some of the top restaurants in Dubrovnik to to dine and drink in when visiting! Close to Pile Gate, in one of the small streets just off Stradun, is this real find – we highly recommend it! A series of small dishes, some unusual, some more traditional, mean that you and your dining companions can pick and choose several items and share them between you. Musts are the Paski Sir (cheese from Pag island) plate and Dalmatian Prsut (Prosciutto); there’s also small fish and meat dishes (small lamb pieces in lavender and honey being particularly unusual) and even staples such as bruschetta and mozzarella with tomato come pleasingly displayed (not to mention tastily prepared). There’s a reasonably detailed wine list (ask for help if you need it) and the service is top-notch – very friendly, and smiles from everyone. There’s some tables outside though these can get taken pretty quickly in the evening; the inside is actually no less fun as the open-style kitchen means you can watch as meals get put together. When we were there, an older American gentleman popped in to take back some soup back to his place of stay (we presume for someone too tired or poorly to make it out), and the restaurant willingly obliged, providing him with the soup in a china bowl with cutlery! In a fantastic location by the Old Town harbour, this restaurant straddles the pathway out to sea. There’s plenty of fish dishes, unsurprisingly, but try one of the equally tasty pasta options for something different. (The Spaghetti Poklisar is certainly very tasty, with both shrimp and Dalmatian smoked ham in a cream sauce.) Service may be a little less friendly than some other places (but not at all rude), but the live jazz (piano and saxophone) more than makes up for it. This is one of the places that teeters close to the edge of being quite touristy – but given its location (just outside the Old Town, near Pile Gate) and its simply stunning views out to sea, we’ll recommend it. (Not to mention you’ll find locals eating here too – always a good sign.) There’s a slightly mind-boggling array of dishes, but they’re of good quality. We’re suggest coming here for lunch (perhaps for a light pasta dish or a salad) or perhaps coffee and a dessert, or a drink or two so you can take in the gorgeous surroundings. Another restaurant in a stunning location overlooking the Old Town harbour, this place serves fish and seafood…and fish and seafood. Unfortunately for those that don’t do fish, there’s not very much on the menu for you…but if you do, you’re certainly in for a treat. Because of the reasonably small seating area, you might sometimes have to queue to get a table during high season, but never for that long, it seems. The plate of mussels is divine, shrimp and prawns too – and make sure you get a carafe of house wine to wash it all down with. Another fabulous location – this time almost halfway down Stradun, although the restaurant is technically just off this main thoroughfare. One of the Dubrovnik’s most famous seafood restaurants, it’s also quite upmarket (reflected in the prices), but certainly the place to come for a special meal. There’s seating outside, but the best place to try and get a table is on the rooftop terrace. Set right in the Old Town Walls (towards Ploce Gate), this is absolutely one restaurant with a view. Another upmarket restaurant, this place has a gorgeous view over the Old Town harbour – definitely the sort of restaurant to come if you’d like a special night. It serves Mediterranean cuisine made from some of the finest locally sourced produce. There’s also a lovely cocktail bar serving excellent drinks. Don’t forget to pick up an ice cream (or several) – the perfect post-dinner sweet, or something to ‘treat’ yourself with after a hard-day’s sightseeing. You’ll see many an inviting slasticarna (ice cream shop) in locations throughout Dubrovnik and the Old Town, including a few on Stradun. There’s also a great one located just next to the Poklisar restaurant. Decide on the flavour of your kugla (scoop, but the word literally means ball) and stroll to the water’s edge to sit on the stone floor and watch the world go by.